Since early October 2016, my Twitter contributions on @lokahiandquill have strayed from the professional realm to focus on an American election whose long-term national and international consequences are immeasurable, regardless which side of the profound divide one sits. I choose my words with care. 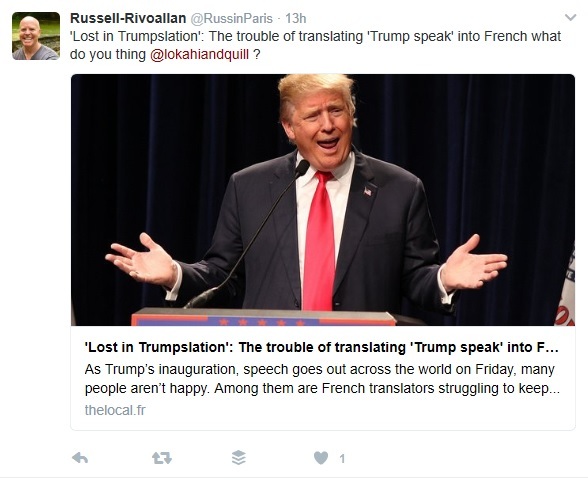 But yesterday on Twitter, @RussinParis queried me about the challenge of translating the new President into French. To do so, or not, is an inherently personal choice, and no one should be judged for the choice they make. I feel blessed my profession allows me to use skills and experience to further businesses, programs, and values I believe in and care about. As an independent professional, I benefit from freedom of choice as to whom to work with and what to work on employees do not have. The professional is personal. As one of the pages on my website states: “What I do reflects on you (dear client).” The reverse, for me, is just as true: what you do reflects on me. I cannot craft compelling copy or speeches and am reluctant to translate content where I do not subscribe to the messages and values to be promoted. Let me nuance — because taking part in informing and explaining is critical. For and about are two different things. The likelihood I’d be called on to write speeches for the new POTUS is, thankfully, zero. I’d refuse to translate his. As a political scientist as well as writer/translator, I would welcome adapting articles, reports and studies about contemporary American politics and foreign relations. Bring ’em on! Transcripsi’s point that someone will translate/interpret the new POTUS, so it might as well be a qualified professional who does it right so no one can claim “I didn’t know” requires answering first a fundamental question: What position is a professional translator/interpreter to take in tackling ANY translation? Where is his/her first loyalty? Is his/her primary goal to be faithful to the source text and its author/speaker (style included)? Or is it to ensure the meaning of the message carries across languages and cultures and resonates with the target audience? I’d touched on that in an article for Traduire, the SFT‘s journal, a few years ago. If the former, should the language-lover be striving to replicate the often yuuge grammatical errors and word confusions the new POTUS is wont to make — some posit, willfully, to hit home with his core constituency — and risk coming across as an inept translator/interpreter? Or is the linguist expected to tidy things up, his/her professional conscience refusing to abide by the excuse of GIGO (garbage in, garbage out)? Would that not strip much of the source expression’s strategy and intent? And if the latter, who is the target audience and what is the message’s objective. Simply considering the new POTUS’ inauguration speech shows how dicey these questions are — particularly given his persona. To do a proper job carrying accurately a message across languages and cultures, one has to get into the speaker’s head (good luck) and understand the full historical, political, and cultural context in which the message plays on the home field (which sooo many native Americans, experts and laypersons, missed in this campaign). The impact of what a translator/interpreter produces can be significant. In his book, The Fall of Japan, William Craig posits that Hiroshima is the result of a mistranslation of Japan’s response ” Mokusatsu” (abstaining from responding to the US ultimatum when issued). The US took it as une fin de non recevoir and launched the bombs on Hiroshima and Nagasaki. How to handle remarks, for example, on China-Taiwan? Translating them faithfully could worsten an already tense situation. When they are Tweets, one cannot adapt the language to adjust to context and intent in 140 characters (supposing one is certain of the real intent…). How would a translator feel about reiterating, in another language, speeches and remarks that insult, offend, or threaten entire categories of human beings? Wouldn’t propagading such views be taking part in normalizing what is not normal at all? After a while, the brain no longer hears background music that repeats non stop. Let us not our senses or our conscience be dulled. I could go on. It is perhaps wise not to. Freedom of thought and expression is already assailed. Ask the press or those denied entry to the US at the Canadian border when travelling to the Women’s March, the two French protesters warned that from now on they’d need a visa to enter the US. Or a black friend of mine with whom I was walking on a quiet sidewalk in Manhattan just a few weeks ago and who was voluntarily smashed into by someone who changed trajectory on purpose, sputing words I will not repeat here. Transcripsi, I took 800 -and-some-odd words to try to answer you when 140 characters could not. It remains an incomplete answer!